We all have different taste in art, music and clothes. One isn’t better than another, just different… like prints and multi-colored patterns versus solid-colored clothes. I prefer solids over prints. Perhaps that’s because I’m a minimalist, but clothes with busy prints and patterns overwhelm me. There may be a reason the LPD (little print dress) never caught on: It’s harder to wear because there are too many competing elements. The fashion trend this fall is to layer prints. Since I know nothing about prints, I sought the advice of Andrea Serrahna, one of the interesting women I met at the Contessa’s California home this summer for lunch. 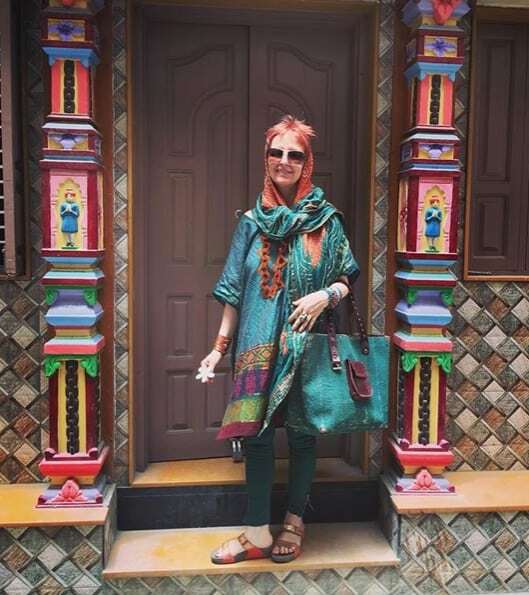 Andrea is a fashion designer who travels to India where she buys bolts of colorful cloth, then has local artisans make them into her designs. 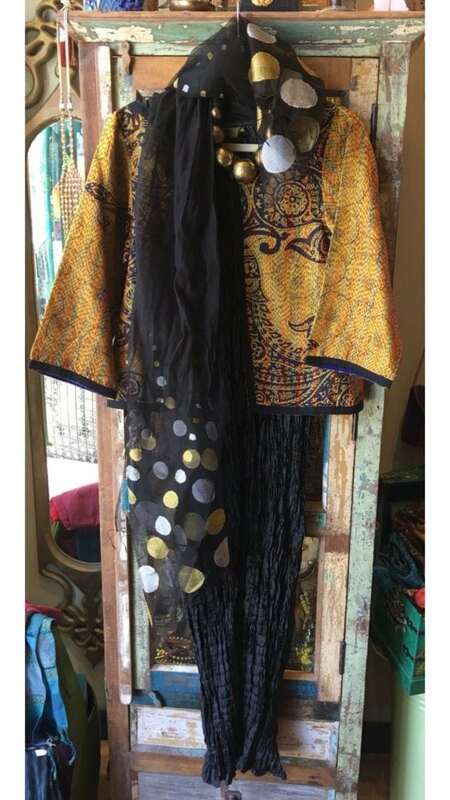 Stop by Andrea’s store in Oakland or if you’re on Instagram, you can find her at @serrahna. Andrea Serrahna, wearing her designs. When deciding what prints to wear, Andrea says it’s important to understand scale and proportion. The scale of the print should be commensurate with the scale of your facial features and your body size. Larger head, eyes, nose and mouth can wear larger prints and vice versa. Your personal energy determines how much print and pattern you can wear. If you have more outward energy, you can handle more pattern, but if you’re demure and introspective, then you should keep to a single print and not mix and match. Layering is good for those who like abundance. When layering prints, it’s always good to change the scale, with one print larger, one smaller. If they’re both the same size, it becomes static and uninteresting. A photo of an outfit Andrea put together with me in mind, although I didn’t buy it. It’s anchored by the solid-colored, crinkled, black sheath that has texture. If you’re going for the exotic look, then go for it all the way with scarves and jewelry, like Andrea, and own it. I think she’s sensational looking! On my next Fashion Friday post, Andrea will advise us about what colors to wear. WARNING!! The rest of this post will be a contrasting color and culture shock! LOL! Subtle patterns like tone on tone or narrow stripes are easier to wear and accessorize, because they go with more things. 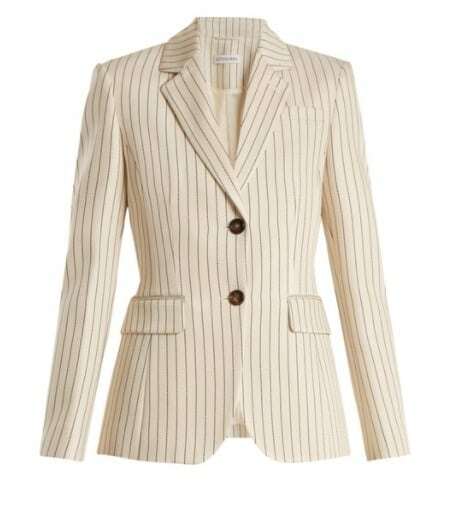 Try a cream colored blazer with thin, vertical, navy stripes or vice versa, a navy blazer with narrow white stripes. 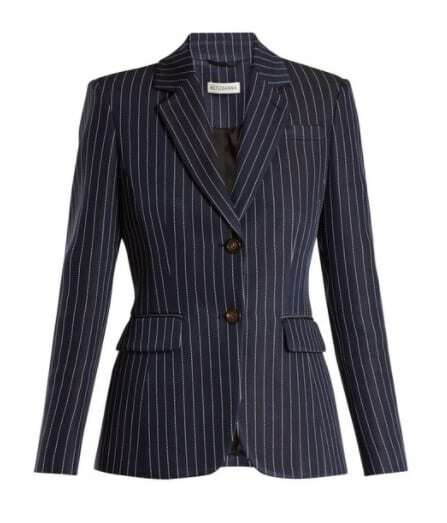 Pair it with a solid-colored pant together with a t-shirt, shell or white blouse. Stripes will never go out of style. Straw or leather bags and shoes would look great with both as would a dramatic rhinestone pin, fabric flower or contrasting handkerchief in the upper pocket. Solid colors. If you think solids are drab and boring, maybe you’re wearing the wrong colors, or fabrics that have an interesting texture. What if you accessorize with a colorful and/or print scarf? 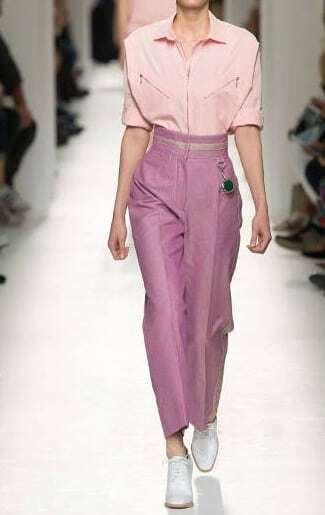 It will give you that added punch of color without being overwhelmed by a patterned blouse or jacket. Perhaps that’s why the LBD (little black dress) has always been so popular. It’s the easiest to jazz up and accessorize. Dressing in varying shades of the same color will create an optical illusion of height like this outfit from RalphLauren.com. The white collar peeking out and the different textures of the sweater, bag and shoes is also a great example of the “two colors rich, three colors poor” theory. Classy but not boring. Another variation of two colors in the same family. When all is said and done, prints or solids are a personal preference. The most important thing to look for when shopping is whether a piece is versatile… Can you dress it up or down on a regular rotation and wear it with other things? If not it will windup as an orphan in your closet. While I love the photos of Andrea, the women in the trench coat with white jeans is wearing exactly the kind of thing I live in, down to the mix of beige and white. I have many clothes that are very old. They are great quality, classics. I’m happy because I don’t want to be part of the environment-destroying fast fashion rat race. Rather unsurprisingly, the things that have stuck around are all solids, except for a few stripes. Something about prints can get dated. Remember the Laura Ashley florals? Then the big, bold florals on black backgrounds? The geometrics of the ’60s and then of the ’00s? One way around it is to avoid the trendy patterns and to go exotic, like Andrea. I’m firmly in the solid camp and live by the two colour rule, although I will sometimes add a pop in a shoe or a bag but only in one or the other. Boring – no! Classic – yes! I love tailored clothes. I was in a store yesterday that was alive with exotic colour. I left feeling happy and alive but also empty handed. I can enjoy it on others but feel discombobulated when I try it on myself. 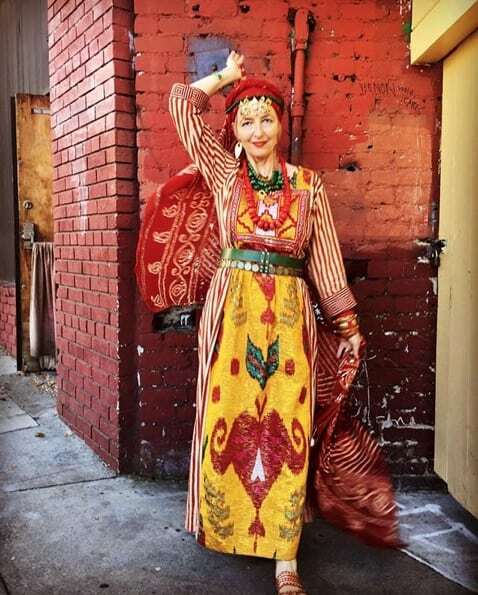 It takes a bohemian personality to wear that much colour. I have no courage when it comes to trying new things. I can look at them on other and appreciate. But when it comes to dressing me? I fade into the woodwork. Sigh. I think I am mostly a solids girl, but I will throw a print every once in a while. Good comparison. Solids ! Across time I know all purchases will mix/match easily. When I do buy a pattern they tend toward Mondrian panes or neo-toile via India or France or England from a century earlier, at a minimum. Bless a good thrift store with estate sale items that went unsold ! Love all these outfits. Wish I had a place to wear more of these clothes. I just bought a few fall items in green moss. I like monochromatic and adding some patterned accent pieces or jewelry. I LOVE prints, as they match my energy and global vision of fashion. It’s fair to say that each and every print I wear represents some sort of either specific, or, esoteric identity. When I mix and combine multiple prints, I feel like I am creating a visual symphony. I don’t shy away from prints, as they bolster and match my large appetite for complex fashion impact statements. Wearing all solids makes me feel momentarily sleek and modern. But I quickly get bored and tire of the rank and file feel of playing it safe. And yet, I so admire those who pull it off! A day without prints is like a taco without salsa, or a sandwich without mustard. Thank you Brenda for creating this post. I enjoy reading the dialogue, recognizing we are all so different, yet we share a big passion for fashion. I think it’s fun to see what other stylish women put together, and Andrea certainly has a unique way with prints. I’m just a solids girl. My one exception is stripes. I am tall with a large frame, and I’d feel like a circus clown if I tried to dress myself in layered prints! The Ralph Lauren design in the photo is just my style. I have started experimenting more in the last few years, I love stripes and polka dots, but I have bought more prints recently and have even print clashed on occasion! Love the post. I laughed about your house dress comment. My grandma ALWAYS wore one, and that brought back so many memories!! I am a love of prints. To me they add so much interest so easily!! Besides you can sweat in them and no one will know! !